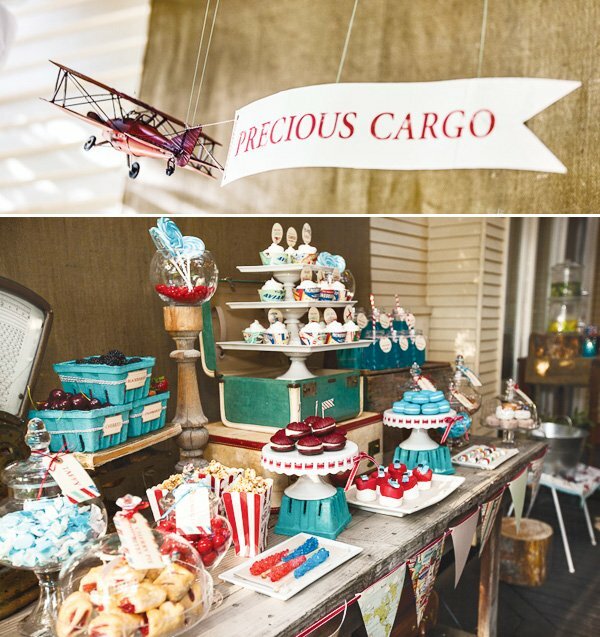 This vintage travel themed “Precious Cargo Baby Shower” is downright AMAZING! 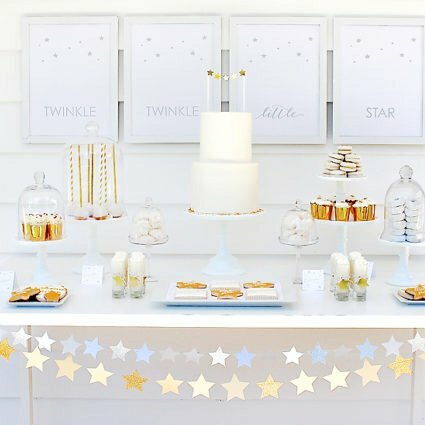 EB from Two Bird Studio enlisted the creative talents of Eye Candy Event Design to help her dream up something extra special for her sister’s baby shower! I love that they were able to utilize lots of vintage props and accessories from EB’s regular home decor for an extra-personal touch. 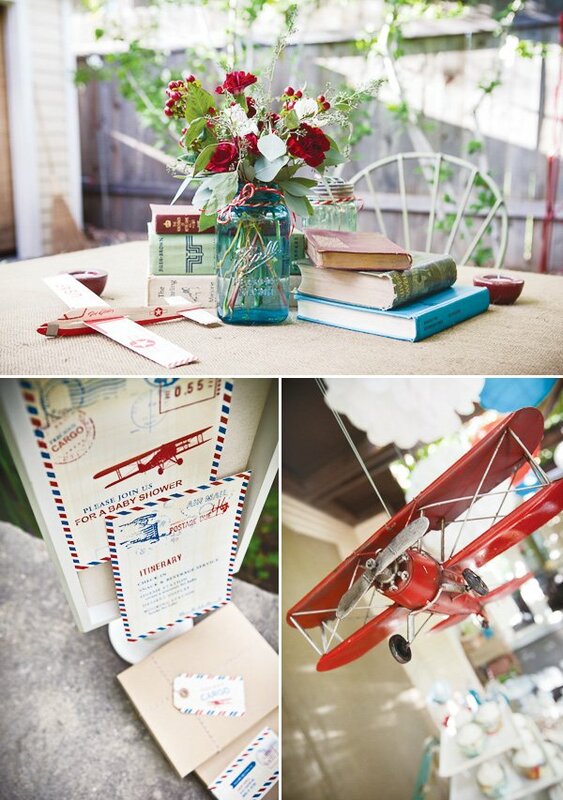 This design would also translate beautifully to a kids birthday (like this Vintage Airplane Birthday Party) OR to a travel inspired bridal shower or engagement party. Fun vintage props like suitcases, books, airplanes, a tricycle & more! I wanted to do something special for my sister’s first baby. I put together the most talented team I knew and they came up with something no less than amazing! My sister is a school teacher so she requested guests each bring a book to fill the nursery shelves. 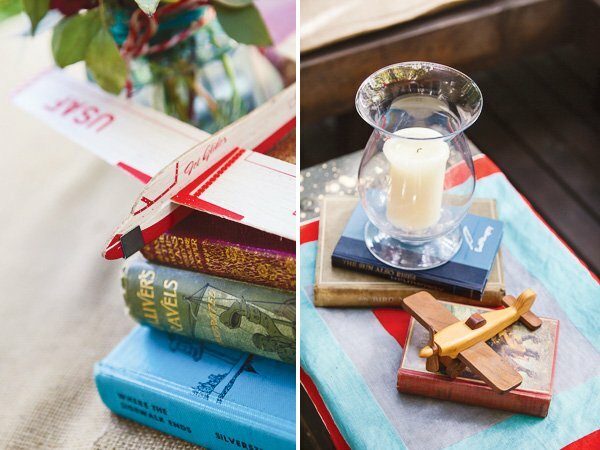 With that request (and the fact that we knew she was having a boy) we landed on a vintage travel theme with old books thrown in the décor. 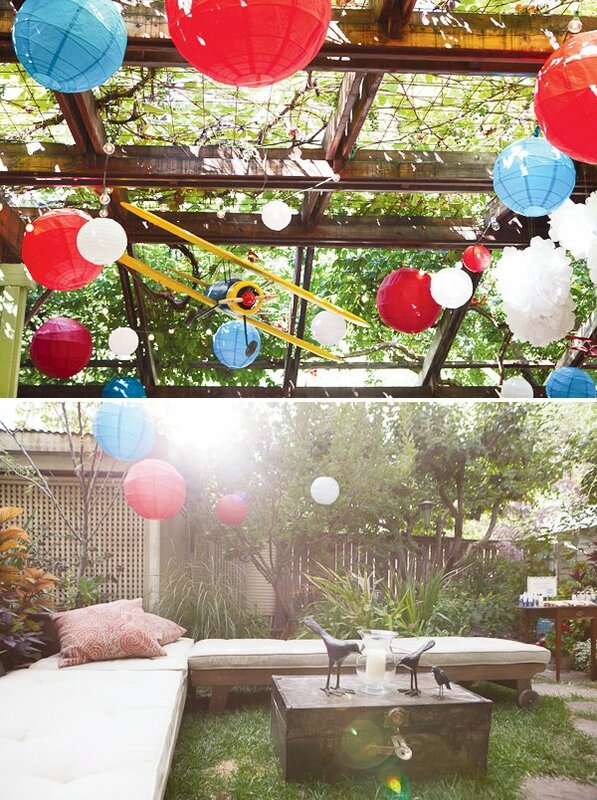 When we were approached by the lovely EB of Two Bird Studio to design a unique travel-themed baby shower we were up for the challenge! We decided to put a twist on the popular “Baby on Board” theme, and we came up with a more modern “Precious Cargo” design. 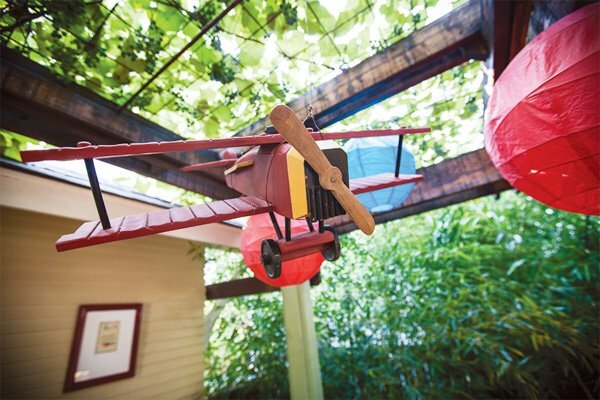 It turns out that we didn’t have to look far for the perfect accessories; a tour of EB’s home produced a collection of vintage airplanes, suitcases, books and even an old-fashioned food scale! 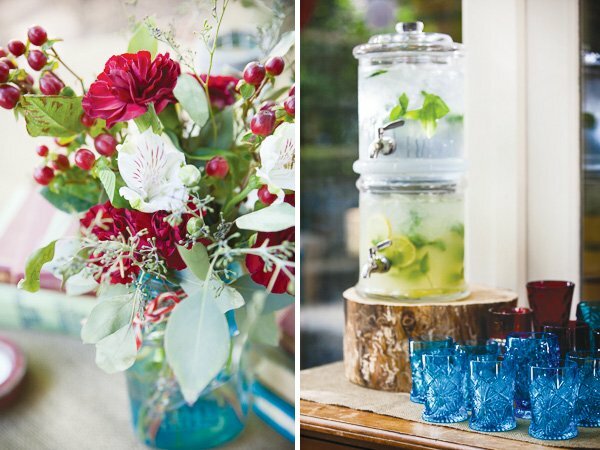 We mixed her “found” décor with pieces from our personal collection and created an amazing blend of design elements for this “precious” event! 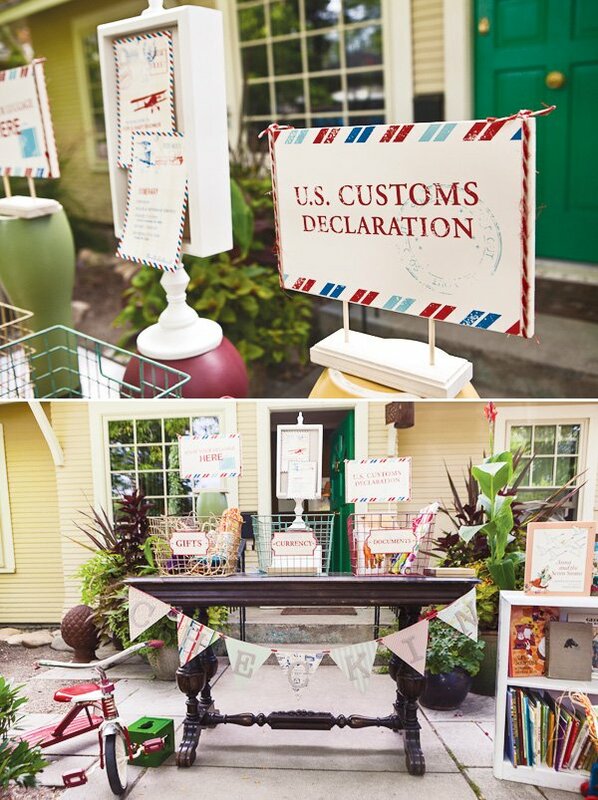 After researching a real travel document, we decided it would be fun to have the guests “check-in” at the front gate of the event to create an ambiance reminiscent of a “customs” counter. We even provided baskets for guests to drop their “gifts, documents and currency” for the mommy-to-be! 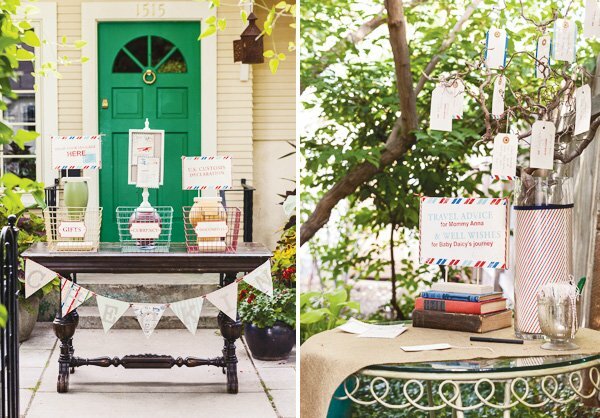 Kristi Farrell of Beleza-Design got in on the action and created all of the custom tags and coordinating invitations. 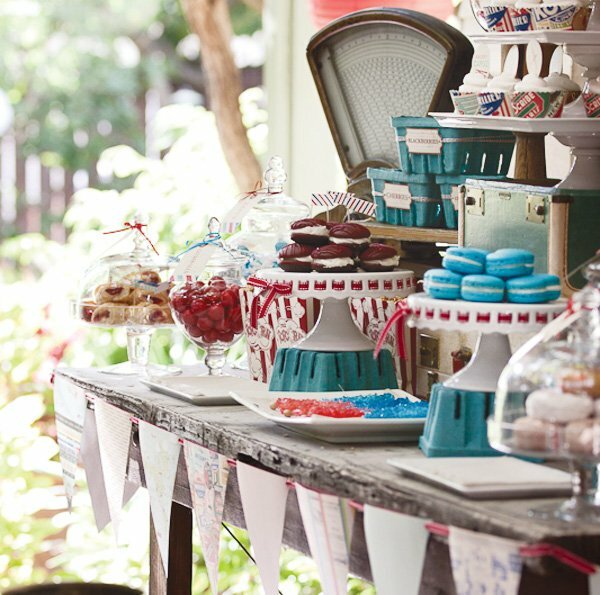 For our dessert display, we placed berry baskets on the vintage scale and embellished it with bakers twine. 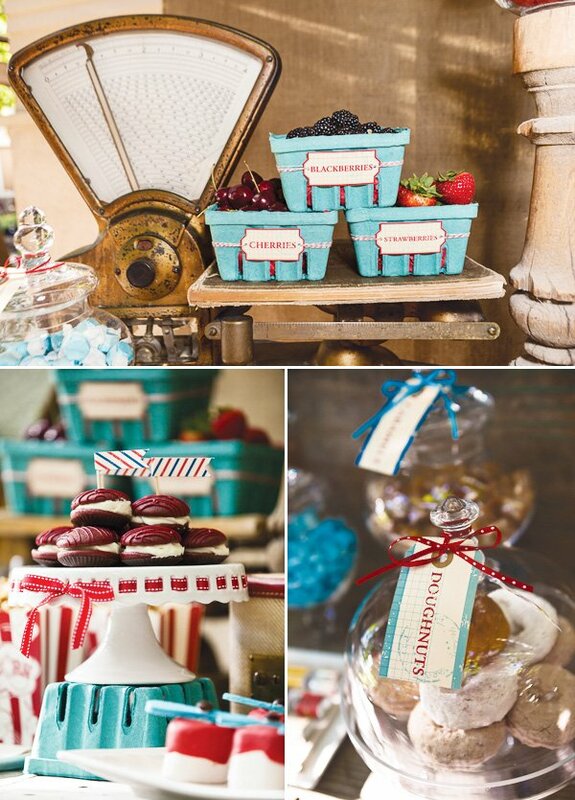 Caramel popcorn and doughnuts added a natural touch to the bright color scheme of turquoise and red. 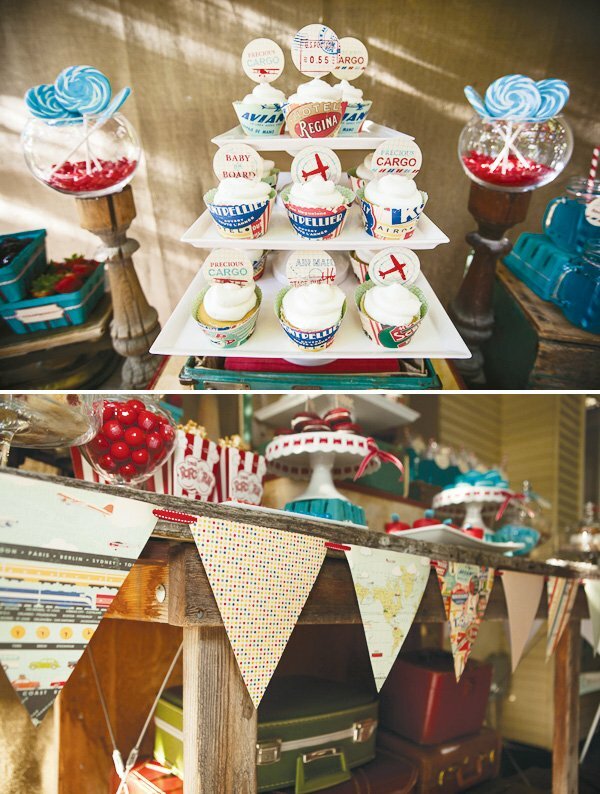 Marshmallow “propellers”, rock candy and gumballs were just some of the treats that adorned the woodworking table. 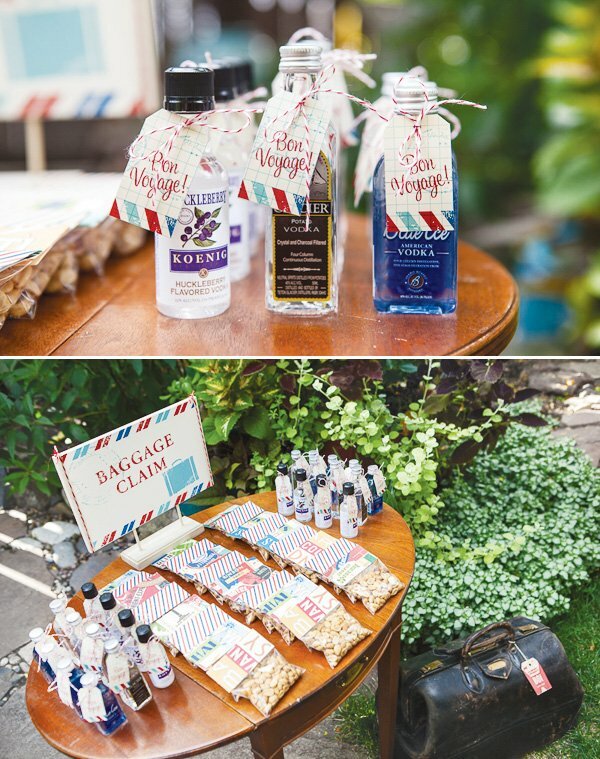 We created custom cupcake wrappers for the centerpiece of the display, and drinks were served in mason jars with mini chocolates wrapped in coordinating paper at the “food & beverage station.” Guests were encouraged to pickup their parting favors of Idaho distilled Vodka at “baggage claim” on their way out of the shower. Laura – it’s just beautiful – congratulations – I’ll look at this one again and again. Love your website and articles!! So UNIQUE! Love it all! this is the most perfect shower I have ever seen and this is the exact theme of my baby to be in Novembers nursery! I am in love! So r u gonna do it? Adorable theme! My friend is having a boy and she is thinking about airplanes. Fell in love with some of your ideas for her shower. Thanks for the inspiration! This theme is adorable! Are designs availalbe on your download section? This shower is so precious..!!! 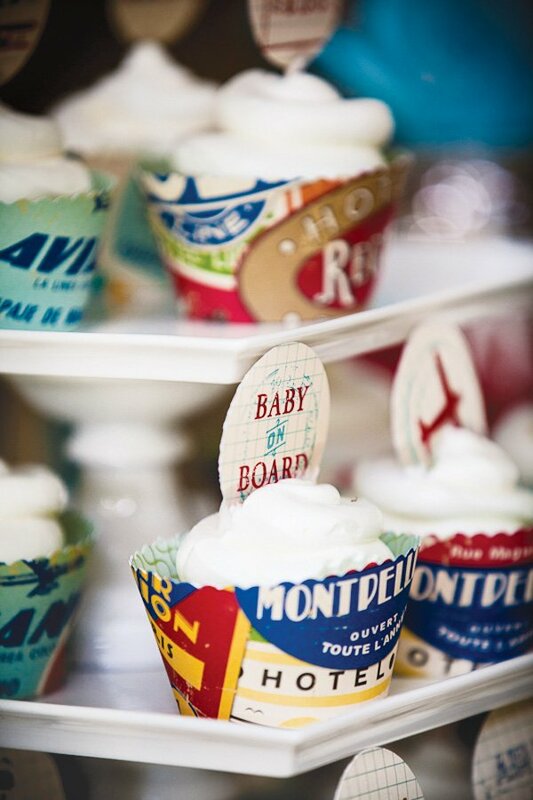 How can I order the cupcake printable s ..?? 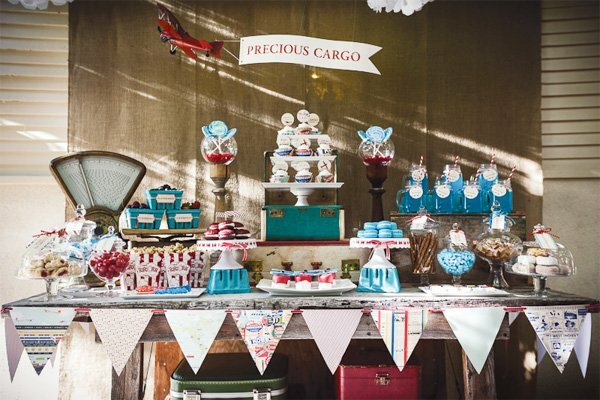 I have found a Airplane museum to have a baby shower for my niece can you tell me where to find the invitations and cupcake holder's you have used love this whole set up awesome job! 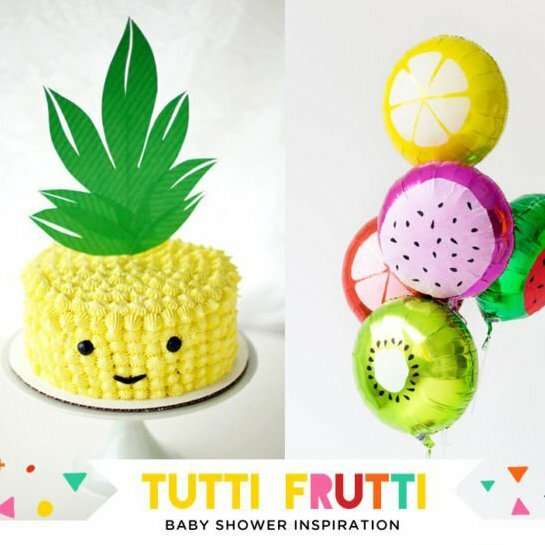 i stumbled upon your blog when i was looking for travel themed baby showers! this is absolutely adorable! where can i buy/find the baby on board stamp? Hi Izza! 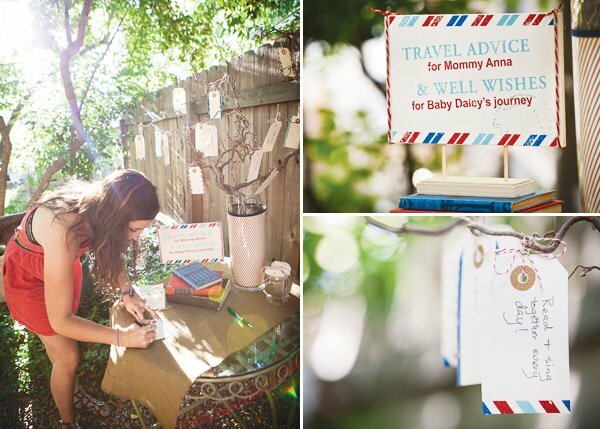 So glad you found us, we have tons of travel inspired baby shower ideas all around the site, but this one is for sure one of my favorites! 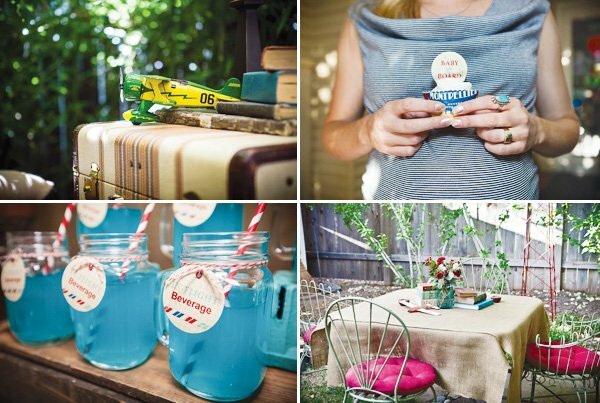 It looks like “Baby on Board” is part of Beleza Design’s printables for the party, her website is here: . 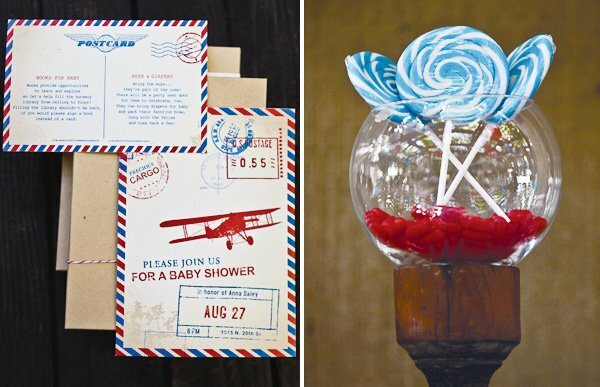 We also have a super cute travel themed baby shower printable collection available for instant download here: http://www.etsy.com/listing/119317843/instant-download-cars-airplanes-baby?ref=shop_home_active&ga_search_query=airplanes. I hope you like it! 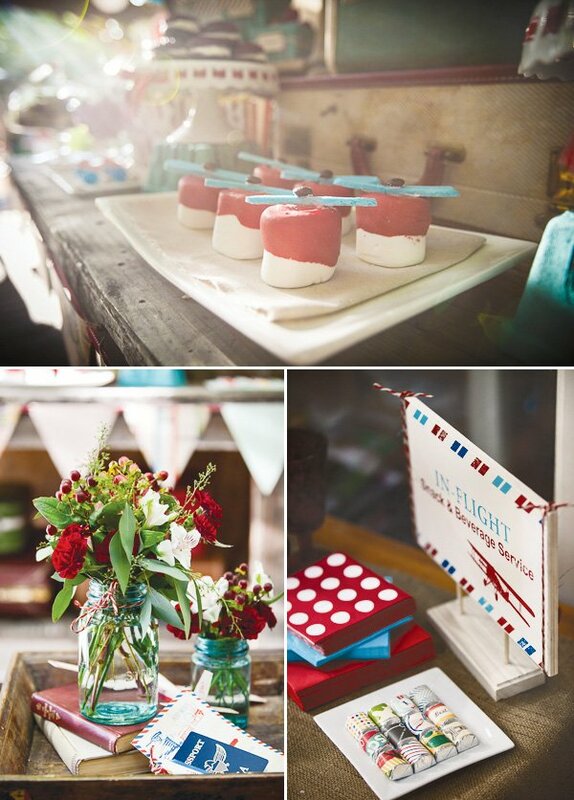 Thank you everyone, we had so much fun designing this event together with Beleza Design. We custom designed everything for this party, if you are interested in cupcake wrappers, invitations, or any other paper goods that you see here please contact [email protected] or if you are interested in any of the treats that you see please contact me at [email protected]. Thank you for all the sweet comments! 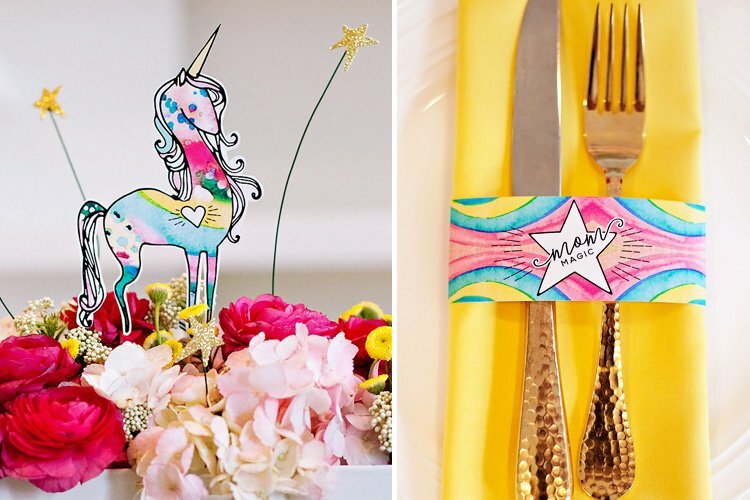 Does anyone know where I can get cute iron on appliques like the ones on the photos? 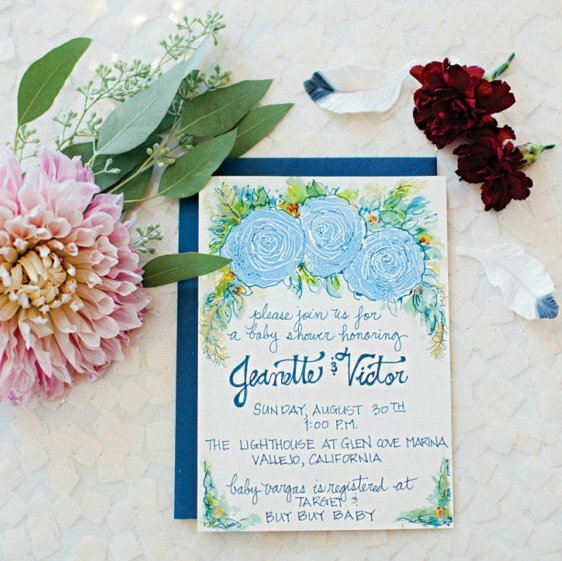 Love the invitations, where can I order. my son and daughter in law having a shower Next monh. 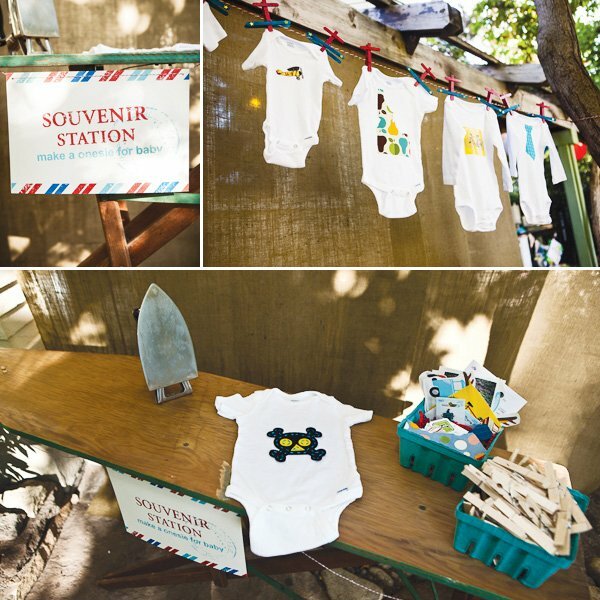 This Precious Cargo Baby Shower is now available on Beleza Design’s new printables website – http://ihearttoparty.com. 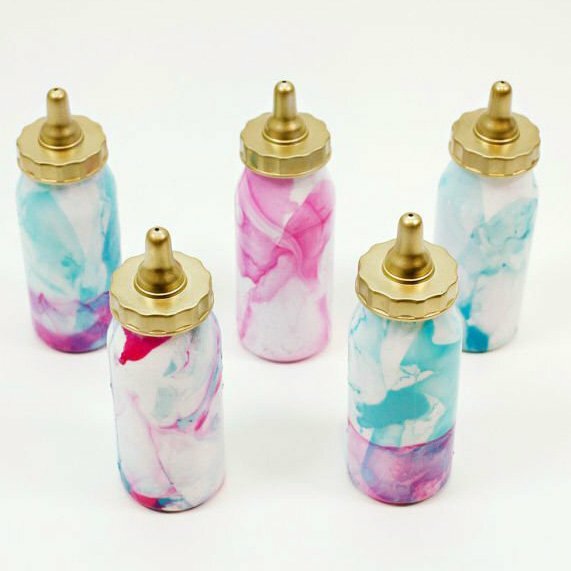 If you don’t want to do it yourself, connect with us through the website for all custom orders! Don’t forget to contact [email protected] for all of the treats to go with your shower! Hey Kristie! If you'd like the shower stationery printed & shipped to you, contact us through our website – . 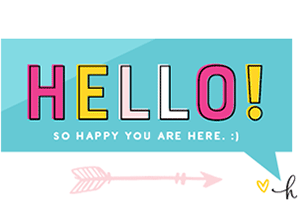 If you're interested in doing it yourself, we have all of the stationery available in printable form at http://ihearttoparty.com. Thanks! How did you do the baby onesie station? Were there types of iron ons you found? Did you give guest instructions? where did you get the cupcake wrappers?